End of an Era. 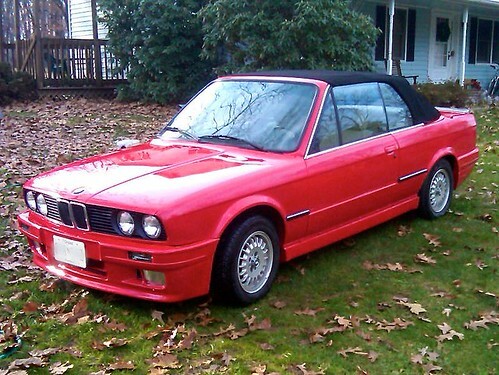 Sold the E30 Convertible Today. We sold the convertible today. I hope the new owners like it as much as we did. 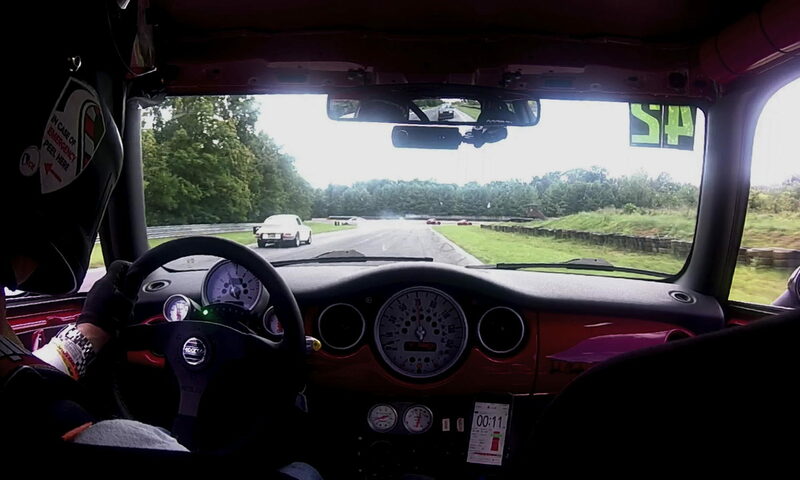 For four years we really enjoyed the car and top-down motoring, but it was starting to demand more attention than the crack GeorgeCo mechanical staff was up to providing. At some point, you just need to make a clean break, and divert your energies to other projects. Someone else is picking up the hard-top next weekend. We sold it for about what we paid for it in 2006, so for the price of four years of maintenance (and countless boxes of parts from Bavauto and PelicanParts.com) we got to have the wind in our hair (GeorgeCo less than the others…) and the sun on our faces. 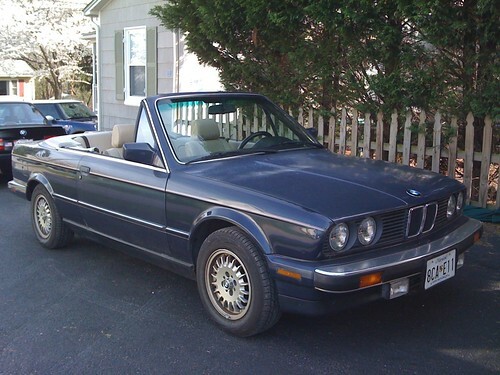 Longtime readers will recall we sold the GeorgeCo convertible last Spring as pictured above. We hoped to find someone who would take the time to restore it. This week we got an update: Not yet complete, but so far, nicely done. About the only bits we recognize are the seat covers. What is that goo that comes out of an electric motor that has seized? We took a brief trip to CA to escape winter and while we were gone, we had some friends watching our house. Because we had some snow and sub-freezing days, we had them run the BMW every couple of days. They must have hit the wiper switch while the wiper blades were frozen to the windshield and not noticed. The motor burned out after melting its plastic cover. I didn’t notice until I was driving to work and tried to wipe the windshield. Then I noticed that smell. Being a former Alfa owner, it was a smell I knew all too well. At first I thought the heater blower had seized because it’s been on its last legs for a while, but the blower still worked. Since it’s a real pain to get to the wiper and replace it, here’s how to first trouble shoot, then replace the wiper motor. Disclaimer: instruction provided for entertainment purposes only. Not responsible if it doesn’t work for you or you damage something in the process. No wagering. 1. Disconnect the battery. Check the 30 amp fuse in position #5 in the fusebox. 2. 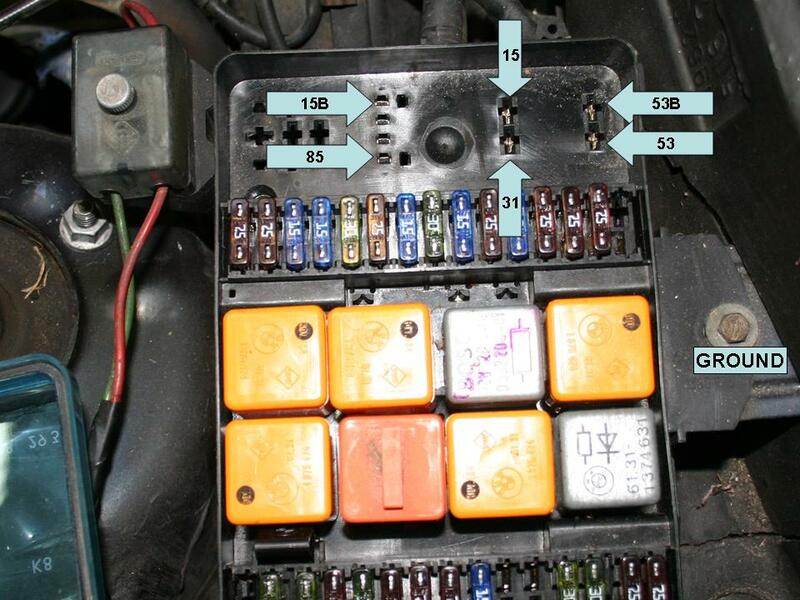 Remove the wiper relay from the fuse panel under the hood (B in the photo above). 3. To test if the problem is the wiring, wiper relay, or wiper motor, you’ll need to test the following in order. To test, you need a piece of 14 gauge (or heavier) wire with a 30 amp fuse and a volt meter. 4. Check for power: Reconnect the battery, with the ignition switch turned on, insert one end of your volt meter in slot 15 and touch the other to ground. If voltage is present, check for continuity by switching your volt-meter to continuity mode and check for continuity between #15 and #31. If no power or continuity, you have to fix you wiring before conducting more tests. Check the main ground connection behind the instrument panel if there is no continuity. If you get 12 volts and continuity, move on to the next test. 5. Again with the batter connected and ignition on, use your test wire with the fuse, cross #15 to #53. The wiper motor should run at low speed. Next cross #15 to #53b. The wiper motor should run on high speed. Cross #85 and ground. The washer motor should run. If the wiper motor ran for these two tests, but doesn’t when the relay is plugged in, your fault is with the relay. Congratulations, this is the easiest problem to fix. If both of these tests failed, you have to assume your problem is with the wiper motor. It’s not expensive if you shop around, but it’s a knuckle buster. 7. 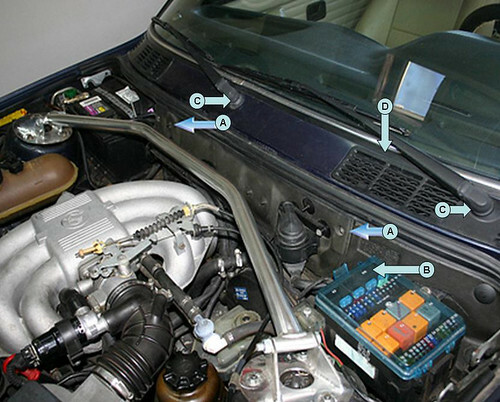 If you have a strut bar installed, you’ll want to remove it to get to the firewall access panel (A). You will have to loosen the wires that run along the panel (mine were held on with zip-ties.) Then remove the panel by removing the four screws and two nuts. Remove the blower cover by loosening the white straps, and then easing the cover out the gap in the firewall. 8. Next, remove the wiper arms (C) and the cowl vent (D) in the photo at the top. To remove the wiper arms, gently pry up on the cover to expose the linkage bolts. Remove both bolts, washers, and covers. Wrap a screwdriver with tape to protect your paint, and gently pry up on the cowl cover, exposing the wiper motor and cover. Reaching through the opening in the firewall, you can pry the cover off of the motor with your fingers and work it back into the opening in the cowl. You probably won’t be able to remove it until the motor is out. 10. Now for the knuckle busting: You’ll have to use a 10mm open end wrench and work blindly. Reaching under the wiper motor, loosen the central nut to the motor. Then remove the 3 10mm bolts that hold the motor to the linkage. Now you can remove the wiper motor out the hole in the firewall and remove the plastic cover if needed (mine was melted.) Be sure to wipe up any remaining “goo” from your melt down, to reduce “that smell…” The photo shows the locations of the bolts you can’t see when installed. 11. Before you start reassembly, plug the relay back into the fuse panel, connect the new motor, and reconnect the battery. 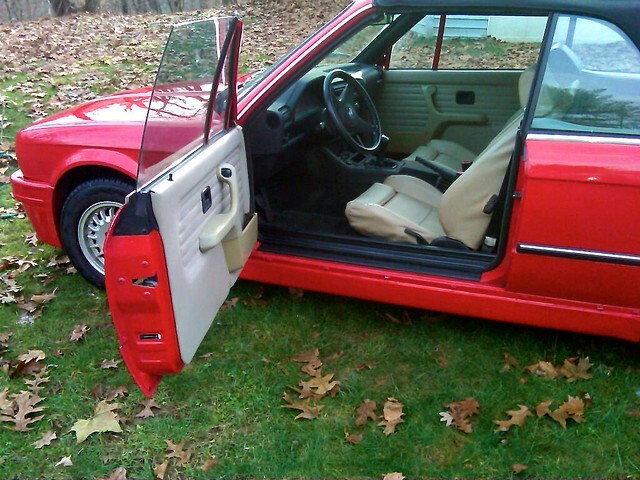 Turn the ignition key to position II, and turn on the wiper at the column switch. Turn the switch off and the motor will stop in the “park” position. Disconnect the battery and be sure to slide your new cover into the cowl opening before you try to reconnect everything. 12. Assembly is the reverse of removal. 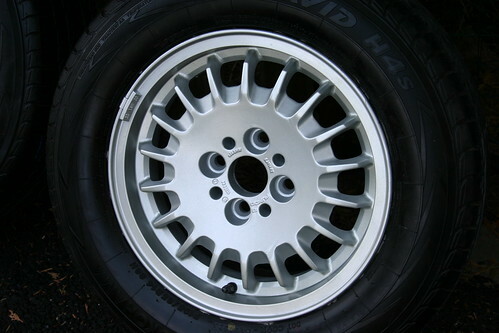 One thing that drives me nuts about the “bottle cap” rims is that they’re impossible to clean. If you leave the brake dust on the wheels it eats into the surface and you cannot really get your fingers in the slots to keep them clean when you wash the car. Since I had a little time off around the 4th of July, I thought I’d repaint the wheels and apply a more durable clear coat that’s supposed to resist high heat and brake dust. If nothing else, for a brief period they will be clean and dust-free. 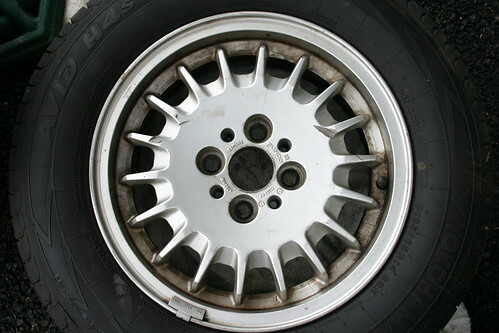 The photo above shows the worst wheel of the set. I’m not sure how the previous owner got that gash in the wheel, but at least it’s on the thickest part of the rim (knock on wood). I have another set of the same wheels with snow tires on them. At some part I’ll swap this one out, but for now, it looks much better. From 10 feet away you can’t even see it. And that’s the goal of this car anyway — a decent 10 footer. All in all, pretty good for a couple of days of work and about $20 in paint. I talked to the experts at Paint World and upon their recommendation, added a third coat of clear to the hood. That made all the difference to get the repainted hood to match the shine of the fenders. I had some paint and clear coat left over so I also repainted the rear panel around the taillights and license plate. Considering I only got a single coat of primer, single coat of color, and single coat of clear on the rear, it looks pretty good. It took a week longer than I planned, and many more cans of paint, but I finally finished the hood. I still need to polish it, but it looks pretty good.